There is a misalignment between our conscious and subconscious minds and it leads to lots of problems and misunderstandings. For the majority of our decisions, we make them with our subconscious mind. 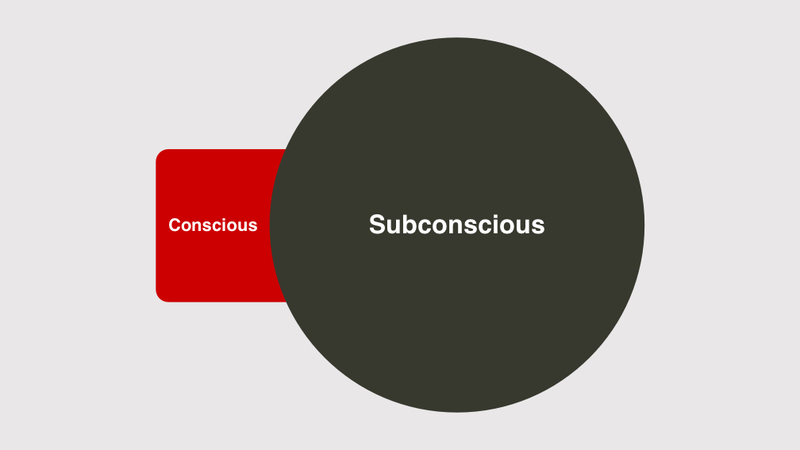 In fact, stats show that up to 95% of decisions we make with our subconscious mind. For most of the time, we are unaware about why we are doing what we are doing. The things we do though, aren’t ‘mindless’. We don’t consciously know why we are doing them. Subconsciously it all makes perfect sense. This creates a huge complexity in understanding of why anything gets done. We research people by asking them questions for their conscious mind to answer. This is like tapping into 5% of their intellect. From that 5% insight we look to make 100% of a decision about what to do in projects, companies, society and families. Matters become more complicated when people have a tendency to forget what they consciously said. Proving the conscious decisions and statements in the long term can be a tricky matter. Most people are incongruent in their nature. This means that their conscious and subconscious minds are not aligned. Incongruence may be very visible and plain, or may be more subtle. People may often say something and do the exact opposite at any point. For example, someone might say that they don't smoke. Few days later you see them smoking and they post-rationalise it as 'it's only a one cigarette here and there'. This incongruence runs across all intelligences humans posses. In spiritual realm, people may not be able to reconcile their view on God. In physical realm, people may tell you that they are vegetarians, but then you see them eating steak next day. So we have people who aren't aware of 95% of their mind, talking to other people who aren't aware of 95% of their mind. This leads to huge complications in life. In physical reality we are much better off observing what people do and deriving their 'character' from there. Rather than listening what they say, we ought to pay attention to what they do. Even doing doesn't 'define' people's identity. Then they do (or don't do). Then they have (or don't have, depending on the above decision). These are complex matters and the reason why humans are a 'wicked problem'. When doing anything with other humans, we ought to be aware of this complexity. People will tell us all sorts of things. They will only do <20% of what they say. Either due to their incongruence or their lack of self awareness. If we are able to understand the true nature of human mind, we will judge much less. We can appreciate people for who they are and build trust on that level. What they say, vs. what they do and have will be discrepant. It might be very discrepant, but that's ... normal. It's all to do with the nature of their subconscious mind. I trust that going forward humans will work on themselves more. The aim is to align the conscious and subconscious minds as much as possible. To achieve congruency and a state where Be-Do-Have become aligned in a (near) perfect fashion. At that point many people become very popular, successful, peaceful or all those things. This is why working self-discovery is a crucial activity for every human. This is why people like Jack Ma describe happiness as the future currency of the world. Happiness is precisely this congruency between conscious and subconscious minds. Whether people realise it or not, we are all looking for that. We all seem to understand this deep inside our subconscious, it just hasn't yet bubbled up to our conscious mind. It will sooner or later! How To Do The Impossible?